L-arginine has been called the miracle compound – and for good reason! Since Nobel Prize winner Dr Ferid Murad’s discovery of Nitric Oxide in the 1980s he says that he is no longer surprised at the ways in which amino acid L-arginine can impact on our cardiovascular system and general health. Whether taken for general health, as a sports supplement or for elite performance, Argi+ is regarded as the very best source of L-arginine that we can provide our bodies because of the synergistic combination with vitamins and herbs. 1. Argi+ makes my running easier – my steps feel lighter and my heart rate is lower for the same pace. I’ve tried this over 5k and 10k distances. 2. I know I am getting a huge Vitamin C and Vitamin D dose with the super fruits added in Argi+ – and, so far I’ve managed to avoid the ‘overly gaunt’ look a lot of runners get. This also means that I seem to be less likely to get colds or pick up viruses after hard training sessions. 3. Drinking Argi+ after a run means that, for me, my muscles recover faster and I get less stiffness in the following morning or the morning after. I also use a recovery protein shake (Forever Lite) too and I believe the Argi+ helps get the nutrition into the muscles more effectively. In fact, on race days, I will mix my Forever Lite protein and nutrition shake with my Argi+ in a glass of water about 3 hours before running. I then find that I have much more strength at the end of the race which I believe is because the Argi+ is helping deliver the extra protein into the muscles where it is needed. 4. With Argi+ I just feel like I’ve got more energy! If I use it late in the afternoon, it often keeps me awake and alert for a hour or two after my normal bedtime – which is not always a good idea! 5. And I run faster and perform better with Argi+. On the occasions that I don’t take my Argi+ (ie. I go straight out for a run and don’t have a chance to have my Argi+ drink 45 minutes before leaving) my legs feel heavier and my breathing is more laboured. It is difficult to measure the exact impact, but I would say that I lose between 1 and 2 minutes on a 25 minute run when I am without my Argi+. 6. I also believe that Argi+ helps me to avoid injury by increasing the recovery rate of my muscles so that I reduce the risk of muscle tears and injuries when I next train. It also means that muscles are in better condition the next day or for the next run, so I am less likely to tear a muscle or develop an injury. 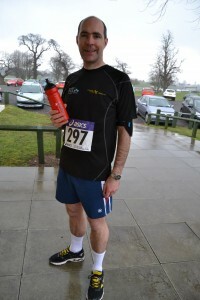 So far I have improved my 10k time by 15 minutes to 48 mins and 15 seconds over a 15 month period – all without injury. Read Dave’s amazing review of how he use Argi+ to aid injury recovery. Lastly, we know from research that L-Arginine, the key amino acid in Argi+, does help deliver more nutrition to the muscles. We also know that L-Arginine helps improve and protect the circulatory system by helping the body create sufficient nitric oxide to dilate the blood vessels and to improve the delivery of oxygen and nutrients to all of your tissues and critical organs. I feel that Argi+ is a smart addition to my nutrition. Watch this video – in which Dr Ferid Murad explains the science and impact of L-arginine and Argi+ or head over to our Fit Shop to order your Argi+. Hello sir,thanks for ur good work.I just started my clean 9 today ND I don’t ever want to get back to fat.the point is that fit1 in Nigeria is very expensive. Pls can u register me to d discount site.thanks.I also want to ask u if d c9 will really reduce my stomach fat. Hi Ogo – yes, I’ll send you a separate email. Hi Neil, I’m a FBO in South Africa, Cape Town. I’ve used the C9 and got myself square regarding my fat tummy. My aim is to pick muscles and build them lean without growing fat tummy. Please help. I’m new in the business and would like to grow it endlessly. I’m not a good marketing person but have embraced the journey. Please with as many tips as you can. I’ve generated a website with FLP but can’t use it because I probably don’t know how to go about it. Thanks. Hi Michel – it sounds like you need your sponsors help (or you upline manager). Remember, they are paid to help you. Hi Kevin – as close as possible, but allowing for the fact that you have to mix it with water. I normally take it about 30 mins before I run but mixed in a very small beaker of water and then I take a longer drink mixed with Argi+ for immediately after the run.